Cosy, well-groomed apartments with an exclusive patio located next to the garden, with swimming pool and barbecue facilities. Informative farm tours, visits to the wine cellar and the possibility to taste our wines and the other organic and biodynamic products grown on our farm: extra virgin olive oil, olives, bread made with ancient types of grain, vegetables and honey. 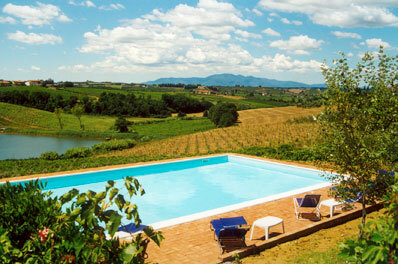 Strategic position for visiting the most beautiful cities of art in Tuscany. 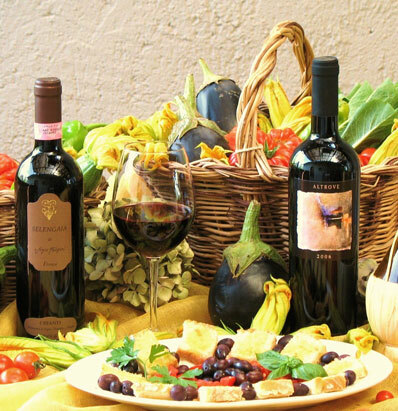 High quality restaurants offering typical Tuscan cuisine, selected and recommended by us. Our organic farmhouse, or bio-agritourism "ll Fondaccio" stands on the hills surrounding Vinci, the birth town of Leonardo da Vinci, a small, antique hamlet set in the heart of the Tuscan countryside. It stands amidst an open, welcoming landscape, in which our vineyards and olive groves alternate with small woods and cornfields, surrounded by Monte Serra and the Apuan mountains on the horizon, the town of Vinci and the hills of Montalbano. The best place from which to enjoy the view is by our pool, maybe taking a relaxing dip in the cool, refreshing water, amongst the backdrop of our aromatic herb plants and the sweet sound of birds chirping away in the nearby woods and the lake in the valley. Nearby, just a few metres away from the pool, our vegetable garden and fruit orchards offer hints for dinner, whilst life on the farm continues around you: Sergio returns from the fields on the tractor, Cristina walks up from the vegetable garden and Roberto tells you about his day whilst fixing a lamp. We opened our organic farm to visitors back in 2000, when our family (Falzari), decided to renovate the old rural annexes adjacent to the farmhouse, thus creating five two-roomed apartments of around 50 square metres, each named in memory of the original purpose. All the apartments are tastefully renovated and furnished with a sense of warmth and intimacy, thanks to the meticulous, devoted renovation work which involved the entire family day by day. The furniture was carefully studied and selected to create comfortable environments with a harmonious colour scheme. The "Limonaia" apartment is equipped to accommodate persons with disabilities: it is, therefore, free of architectural barriers and also has a specially equipped bathroom. All the apartments have an exclusive outdoor area with a veranda or patio, covered with a pergola or with a porch, where our guests can enjoy calm moments with their family or romantic candle-lit dinners in a relaxed, intimate atmosphere, listening to the quiet night-time hum of the countryside. The barbecue facilities and pool are just a few metres away from the apartments, amidst the flowers and plants in the garden. 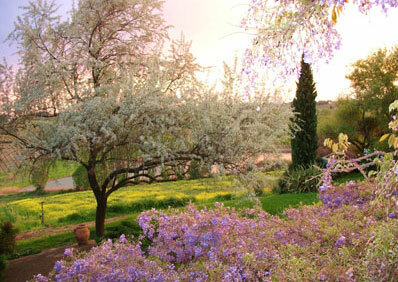 The pool is surrounded by trees, broom, lavender and rosemary plants and is south-west facing, overlooking the lake and the valley in which it lies. The lake is now a refuge for small aquatic animals and surrounded by tall, wild reeds which offer a safe hiding place to the hedgehogs, hares and pheasants which live in this restocking game reserve of two hundred hectares, in which hunting is prohibited and which covers the entire property of the Fondaccio and our organic farm. In each apartment there is a folder containing a guide with all the information needed to make your holiday in Tuscany rich and enjoyable: a list of elegant restaurants selected by us, inns offering typical Tuscan cuisine, outdoor markets, country feasts and fairs/shows, shopping facilities (the Arno valley is well-known for its offer of traditional hand-crafted products, clothing and leather accessories) and locations with a particularly interesting display of handicrafts, such as the Museum of Ceramics in Montelupo Fiorentino. An internet connection is provided in each apartment, which you can use to find more information and plan a pleasant outing, according to your desires and curiosity, perhaps to Florence, Lucca, Pisa, Siena or San Gimignano. 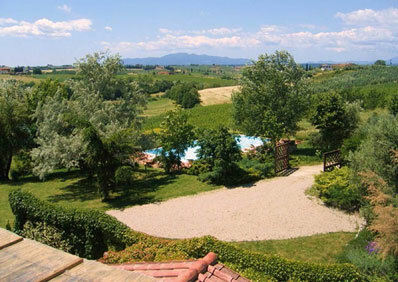 We are literally “surrounded” by the most beautiful cities of art of Tuscany! Vinci and the surrounding hillside offer facilities for fun and entertainment and relaxation/leisure facilities for all tastes. Take a trip back in time to discover the life and fascinating, extraordinary inventions of Leonardo da Vinci in the Museum dedicated to him, inside the walls of the castle, or visit the house in which he was born amidst the woodlands of the Montalbano, just two kilometres away from the village of Vinci itself. A bike ride, a walk or an excursion on horseback through the hills covered with vineyards and olive groves, or the woods of the Montalbano, or a game of golf on the nearby golf course are ideal if you like to be surrounded by nature. If you prefer to simply relax and slow down the pace of everyday life, why not go for a regenerating dip and massage in the spa of Grotta Giusti, just a twenty-minute drive from the Fondaccio, or simply enjoy a good book in the shade in our garden and the quiet of the countryside. During your stay, we would be pleased to spend a few hours with you to show you round our wine cellar and farm, where you are welcome to taste our organic, biodynamic products: wine, extra virgin olive oil, olives, vegetables, honey and bread made with our specially milled flour. This is a moment for getting to know each other, to talk about organic, biodynamic farming and tell you the story behind our Chianti wines: "Selengaia", "Altrove" and "Tinnari". We believe that by "listening" to the soil and the plants on the land, it is possible, little by little, to create a sincere, harmonious relationship of exchange, one of mutual "emotions, sensations and nourishmen". We wish to rediscover the antique, authentic tastes of the land as a gift from living, sensitive creatures. In an aim to blend antique know-how with modern husbandry methods and technology, we cultivate our vineyards and olive groves according to biodynamic crop-growing methods which aim at preserving the integrity, the richness and vitality of the land and the plants and, therefore, the fundamental element of biodiversity. Thanks to patient research and experimentation, our wines, which are certified as organic, are produced by spontaneous fermentation without the use of yeasts and other nutrients. Encouraged by the desire to nourish ourselves with authentic food, we sow and cultivate antique varieties of grain with which we make our own bread every week, as in the olden days. A swarm of bees, maybe attracted by a place where efforts are made to respect the balances of nature, has chosen one of our vine branches to build a new home... also giving us a first taste of honey! In a few years' time, we also hope to be able to taste the products from the small fruit orchard, planted in 2009-2010, which includes antique fruit tree varieties. We look forward to meeting you at the Fondaccio, to share our passion not only for agriculture but also art, music and painting, good company and good cuisine... with the omnipresent glass of "good wine"! Roberto, Sergio, Cristina, Mother and Father (Clementina and Sandro).